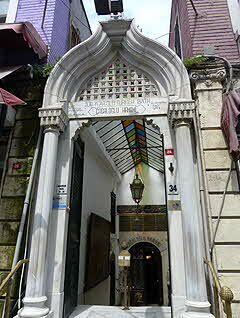 On Friday, Erika and I went to a bath house to experience a Turkish bath. There is no bath, per se, at least in the Western understanding. Rather, the term refers to the way one is washed and massaged by an attendant from head to toe. We were a bit nervous. We had looked at several, but we had some trepidation about both the cost ($75-$100 per person) and the general level of intimacy it might involve. We decided to try Cağaloğlu Hamamı. It was a bit more expensive, probably because of its fame and popularity, but for our first time it felt like a more comfortable option. It is quite old and has been frequented by many celebrities over the years. Their entry way has photos of famous customers. Finding the right place was a bit challenging. Though some of the other places were equally well-reviewed, the entrances were often in disrepair and we found our Western expectations overriding our bravery. We take for granted that businesses should be in good repair and look relatively new. In Istanbul, as in many other older cultures and especially in more urban settings, the old adage “don’t judge a book by its cover” can’t be more true, but its very difficult to see past that cultural programming. Another challenge was the separation of genders. 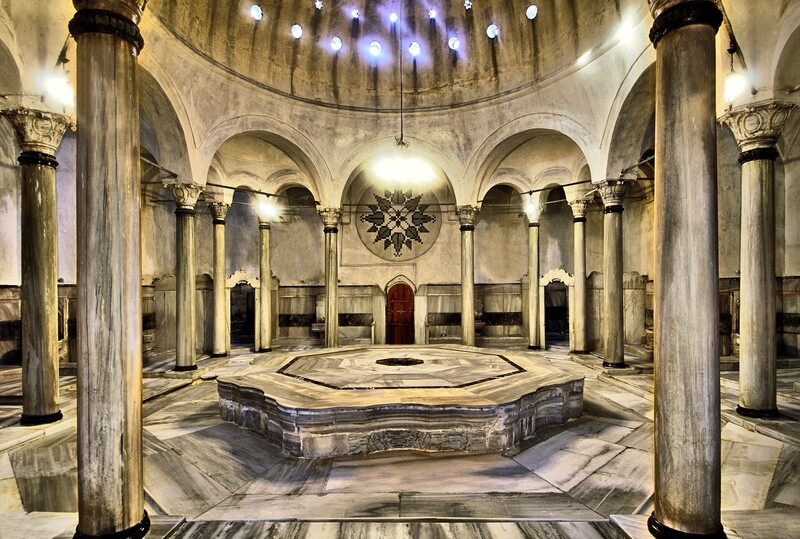 Not all hamams are large, so many of the bath houses have different times for men and women. Çukurcuma Hamamı seemed like a nice option, but we would have needed appointments hours apart. Perhaps the greatest challenge, at least for me, was the level of intimacy implied by the service. As a male, there are tremendously powerful cultural messages within the United States about what is “appropriate” male to male touch. It most often must be aggressive – e.g. fist to fist, shoulder to shoulder – and hugging is reserved mostly for family relations. Turkish culture, on the other hand, even though it is in many ways even more macho and male-centered than American culture, sees little threat in male to male touch. It is not uncommon to see two men sitting close with arms around each other or walking and holding hands as friends. Western history includes a fair amount of shame. We fear the body – its desires, its functions, the way it feels. Modern media doesn’t help with its emphatic emphasis on perfection and sterility. Going into this bath, I was quite aware of my body. This trip has had much good food and I feel like I put on a few pounds. So, upon entering the hamam, my mind was astir with mixed emotions. The men’s area is immediately within the entrance and the women’s off to the right through a doorway. Around the walls of the foyer were small dressing rooms. Men were walking around with only towels around the waists. I was guided to one of the rooms, given a similarly small, thin towel (think shawl), and told to undress. “Towel only” was the instruction. The dressing rooms lock, so I took the key with me to the back area. 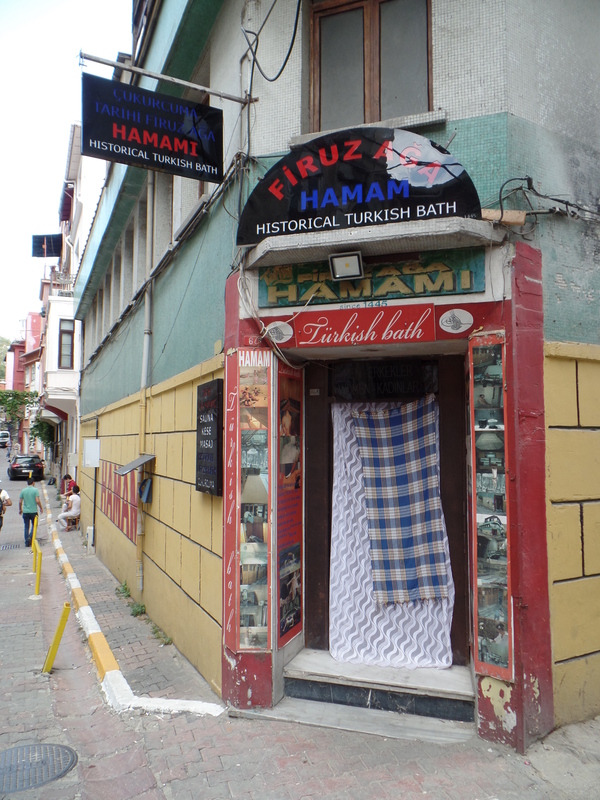 This is the actual hamam, or sauna. The entire place is made of marble. Around the edge are marble sinks and in the center is a raised marble platform. It was very warm and humid, not quite as hot as a sauna one might find in America, but close. I was told to lay down on the center slab and relax. Even though it was hard, it was surprisingly comfortable.The marble was pleasantly warm and seemed almost soft to the touch. I laid down and filled my lungs with the warm moist air. It was amazing. My entire body was wet from the humidity and I almost dozed off. Other men arrived and were situated around the raised area. Just a bunch of dudes with tiny towels laying together on a marble slab. My attendant, a muscular, hirsute man with a thick Turkish accent, put a small pillow under my head and began to knead my belly. His strong hands moved from my abdomen, to my chest, then each limb in turn, finishing with my head and face. He had me turn over and did the same for the back. I have had many massages before, but nothing quite so, well, intimate. It was appropriate, mind you, but he did it with such a familiarity that it caught me a bit off-guard. Massages in United States, though certainly intimate (after all, one is essentially naked with a stranger), also have a somewhat clinical feel at times. Being such a legalistic, fear-based culture, I’m sure this “professionalism” is mostly a way to minimize liability. Not so in Turkey, apparently. Masseurs jump right in like they’ve known you for years. After some time on the slab, he walked me over and sat me by one of the sinks. He dipped a bowl into the sink and doused me with cool water. It felt great. He then scrubbed me with a rough mitt, dousing me periodically, then washing me with lovely, lemon-scented, sudsy soap. Every time he rinsed me, he would sigh something like, “Ahhhh, yesssss. That’s good.” Part of me wanted to find that creepy, but really, he was just trying to help me relax with what little English he knew. My towel was soaked. So, when he laid me back down, this time near the sink, he asked me to lift myself off the floor slightly. He gently took off my towel and lay it over my groin. He rubbed me down some more, this time more intentionally focusing on tight muscles, then turned me over and did the same for the back. On each side, he continued to soap and rub, then when he finished he poured cold water over me. I was surprised, but relieved. the extreme temperature chance was refreshing. After he finished, he took me to an area with two sinks, one cold and one hot. This was for me to alternate on my own, as I pleased. I stayed there for about 10 minutes. At the exit, he was waiting with a fresh waist towel. He put out his hand for the wet one, which I handed him, then he wrapped a dry one around me and put fluffier ones around my shoulders and head. We walked to my dressing room and he bid me farewell. Overall, I found the experience to be wonderful. I was forced to face my assumptions about masculinity and intimacy in a way I had not before. At no point was the service inappropriate, rather I found the familiarity to be soothing. I will certainly do this again. What great descriptions of your experience. I just shared Tom’s with my friend Cedron who is a massage therapist and will definitely relate to Tom’s reflections what this was like for him. It all sounds amazing! Keep enjoying.